How to Earn Profit from EOSDApp “Game Mining”? What can you do with the EOSDApp game tokens? In fact, different DApps have different token mechanisms. How to balance token output and consumption through the game design and maintain the value of tokens can be used as a criterion for us to determine whether a DApp project is good and reliable. And from the current output halving mechanism (this is, mine a certain amount, reduce the proportion of betting return tokens, e.g. with the initial 1 EOS bet could get 10 tokens, afterwards betting 1 EOS can only get 5 tokens, each DApp rules are different.) If you participate in mining at the beginning of the project, there is a high chance of getting the initial bonus of the project. 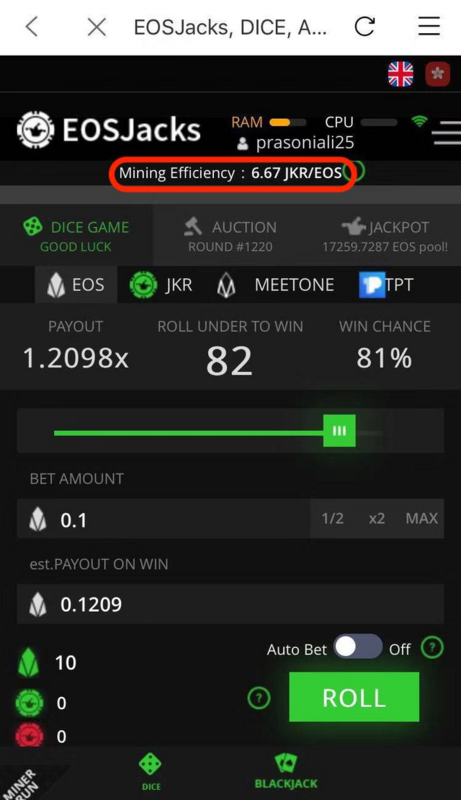 The initial output ratio of the EOSjacks project is betting 1EOS get 20 JKR as returns and right now it has reduced its production to 6.67 jkr. Fortunately, I participated in the jkr mining in the early stage, but my investing costs weren’t much, just about 50 EOS. So far, the stake of jkr tokens has received nearly 100 EOS, moreover jkr token has also been listed on an exchange platform. 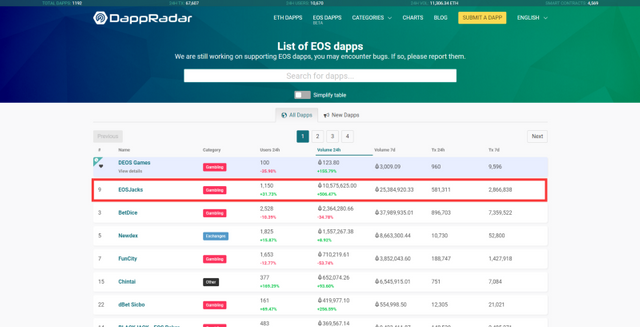 According to the current market price, the tokens originally mined with 50EOS could been exchanged for approximately 200 EOS at the exchange platform. So, how to earn profit “Game Mining”? According to most of the current mining mechanisms, the initial stage of the project must have the highest reward ratio, so if you can participate in mining to obtain tokens in the early stage, you will get more tokens at the same cost. Most DApps use a dividend-stake model. This means, the game tokens EOS dividends are obtained from the token lock-up. Let´s take Jacks as an example, each stake of 10K jkr can get 4 EOS dividends per day (this dividend is not stable and will vary according to the pool reward). A good DApp Team maintains the output and balance of the tokens with the game design, then these tokens will also be stable at a relatively stable price. Selling the tokens obtained at an appropriate time can gives you a big profit.